Price includes postage within the U.K. Shipping to the U.S.A. add £40 Western Europe add £15. 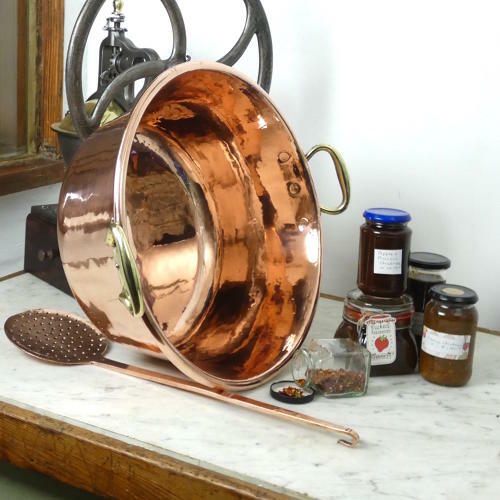 A large, French copper, preserve pan. This pan is made from a substantial gauge of copper and it dates from c.1890. It has a rolled rim, and there are brass handles to either side. This type of pan was used when bottling preserves. Bottles or jars were put into the pan, in boiling water. They were filled with the preserve and then the lids would be tightened thus creating a vacuum. They were never tinned for this purpose as the food was not coming into contact with the copper. This piece is in excellent condition.